Jim Kunze has been in the business of Automotive Custom Painting for 30 years. 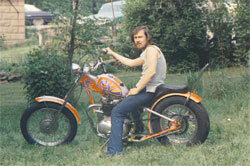 I Started airbrushing motorcycles in my house in 1970. That was the chopper era, and mainly worked on outlaw bikes for some of the local clubs. After twenty some years of progressively larger shops, employees, overhead, collision work (to pay the bills), and all the other headaches related to a business, I now have a small, out of the way, one man shop, and finally back to doing only paint work. Don't want to do any more body work, restoration, prep work, etc. Everything that comes to me now has to be ready to paint. Any exceptions would have to be discussed. For the last few years I have given into the computer, which assists me in airbrush work. Also, to do some vinyl signwork, and design logos, among other things. I work on a one to one basis with my customers. And just concerned with putting out the best, and most creative for the job at hand.